Wood Wagon Wheels, Wooden Wagon Wheels, Civil War Era Cannon Wheels, Wood Wagon Wheels, Handmade Today In The USA! Wood Wagon Wheels, Wooden Wagon Wheels Handmade in the USA. Wagon Wheel Chandeliers, Civil War Era Cannon Wheels, Horse Draw Wagon Wheels and Wagons. Wood Butter Churns, Wood Buckets. Yesterdays Handmade Wood Wagon Wheels, Handmade Today .For over 50 Years, our family has been making Wood Wagon Wheels for sale in Eastern Kentucky and Eastern Pennsylvania. 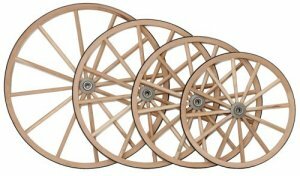 All of our Wood Wagon Wheels for sale are hand made from quality materials and made in the USA. We do not produce or sell seconds, only quality made Wood Wagon Wheels. 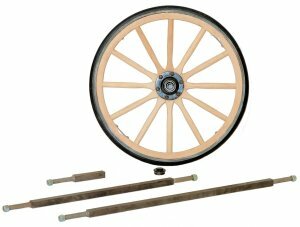 Our Wood Wagon Wheels, Steel Wagon Wheels, Cannon Wheels and Buggy-Carriage wheels can be found around the world on working wagons and carriages. Our Wood Wagon Wheels can be found in movies, on TV, in theaters and major theme parts from Disney to Silver Dollar City. There are many uses for our Wood Wagon Wheels from garden and yard décor, to functional yard carts and wagons, decorative yard carts and wagons. Many or our Wood Wagon Wheels are used for display carts for their products; from clothing stores to grocery stores. We can custom build any size or type of axle to custom fit your Wood Wagon Wheels and your project. No matter what size Wood Wagon Wheel or axle you need for your project, we can make your axles for you. Our metal axles are made from solid square solid steel stock, machined on each end to match the wagon wheel, the ends are threaded and shipped with nuts for the ends. For Axle Pricing, Please Contact Us..
Click Image To View Cannon Wheel Larger Image And Read More Information. Wood Wagon Wheels, Wooden Wagon Wheels Handmade in the USA. Wagon Wheel Chandeliers, Cannon Wheels , Horse Draw Wagon Wheels and Wagons. Wood Butter Churns, Wood Buckets. Yesterdays Handmade Wood Wagon Wheels, Handmade Today .For over 50 Years, our family has been making Wood Wagon Wheels for sale in Eastern Kentucky and Eastern Pennsylvania.